Banksy in New York, by writer and photographer Ray Mock, is the ultimate companion to the British artist’s month-long romp on the streets of New York in October, 2013. Mock, founder of the independent publisher Carnage NYC, has been documenting street art and graffiti in New York and around the world for almost 10 years. When British street artist Banksy commenced his month-long “residency” on the streets of New York, the author’s unfortunately-timed layoff gave way to a breathless, daily hunt for new illicit artwork. Banksy in New York offers a first-hand account of the daily events surrounding the artist’s residency: the defacement and removal of his pieces, reactions from neighbors and building owners and interactions between Banksy’s fans and foes. The author draws on his extensive knowledge of street art and graffiti in New York to assess the impact of Banksy’s work from a cultural and art-historical perspective. Mock is as much a fan as a critic of the artist’s work and delivers his account in the form of a personal narrative that is by turns insightful and humorous, paying homage to Banksy’s wit and creativity while challenging the artist – and his detractors – to consider the true impact of his work. 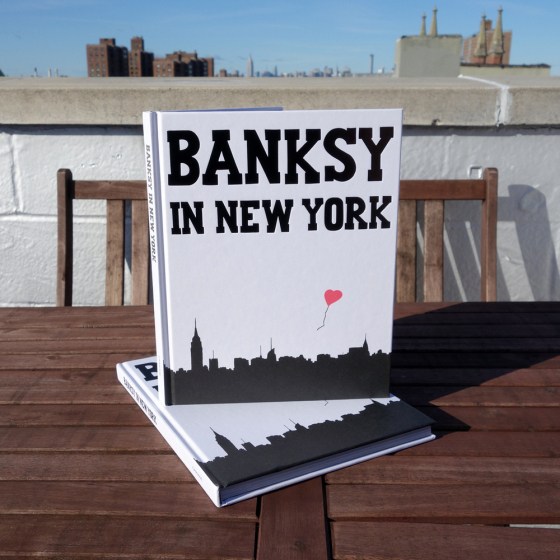 The hardcover edition of Banksy in New York features over 140 photos and illustrations on 128 pages as well as a new preface by Brooklyn Street Art founders Jaime Rojo and Steven P. Harrington.